ROUNDDOWN in Excel (Formula, Examples) | How to Use this Function? 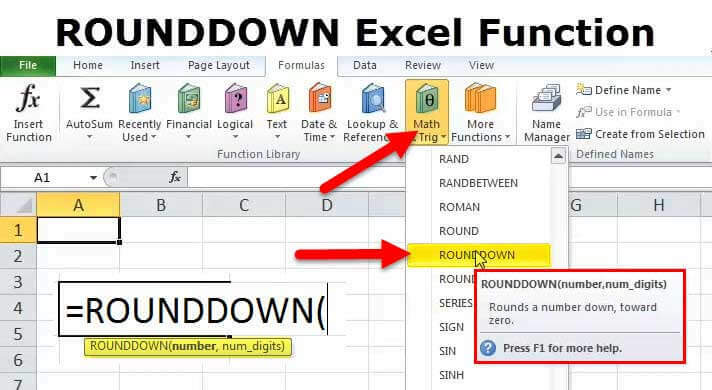 ROUNDDOWN function is a built-in function in Microsoft Excel. ROUNDDOWN excel function is used to round off the given number. This function rounds off the given number to the nearest low number w.r.t the given number. text = It is a required parameter. It represents any real number that is to be rounded down. number_of_times = It is also a required parameter. It is the number of digits to which you want to round the number down. ROUNDDOWN function can be entered as a part of the formula in the worksheet cells. Refer to a couple of examples given below to know more. Let’s look at the examples given below. Each example covers a different use case implemented using the ROUNDDOWN Function. In the above example, cell B2 is an input number with value 2.3659. Result cell is C2 wherein the ROUNDDOWN formula applied is =ROUNDDOWN(B2,0) which means rounds down the value in B2 with zero decimal numbers. This yield result as 2 and the same is seen in the result cell C2. In the above example, cell B3 is an input number with value -1.8905. Result cell is C3 wherein the ROUNDDOWN formula applied is =ROUNDDOWN(B3,1) which means rounds down the value in B3 with one decimal number. This yield result as -1.8 and the same is seen in the result cell C3. In the above example, cell B4 is an input number with value -1 233128.698. Result cell is C4 wherein the ROUNDDOWN formula applied is =ROUNDDOWN(B4,-1) which means the number is to be rounded down to the left of the decimal point by 1. This yield result as 23312. The same is seen in the result cell C4. It rounds off the given number to the nearest number down the given number. Both the parameters are required ones. If the 2nd parameter i.e. num_digits is zero then, the number is rounded down to the nearest integer number in the ROUNDDOWN function in excel. If the 2nd parameter i.e. num_digits are greater than zero then, the number is rounded down to the number of decimal digits mentioned in the ROUNDDOWN excel function. If the 2nd parameter i.e. num_digits are less than 0, the then number is rounded down to the left of the decimal point in the ROUNDDOWN function.